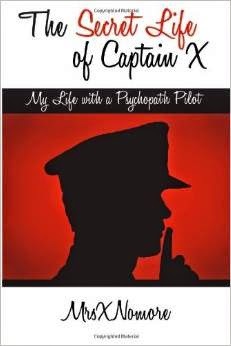 “The Secret Life of Captain X: My Life with a Psychopath Pilot” is the memoir of a woman who was controlled, manipulated, and emotionally abused by her psychopathic pilot ex-husband. The book is organized chronologically, beginning with the author’s early life with her alcoholic father. You also get a look into the author’s early adulthood, when she was a professional dancer in New York. The author’s life with Captain X begins when she calls a number her friend gave her on a piece of paper. The relationship begins like a dream, but ends like a nightmare. In between the beginning and the end, the author must grapple with infertility, adoption, medical difficulties, and abuse alone. She eventually discovers her husband is a psychopath and part of a criminal “brotherhood” that seeks to encourage prostitution. Reading the book is an emotional journey. You feel the pain of a woman who survived a nightmare. But at the same time, there is also the opportunity to learn a lot of lessons about dealing with people who manipulate, control, and victimize others. This book is an absolute must-read for anyone who is/knows someone who is emotionally abused.